The lunching of "BBC IGBO SERVICE" by the European largest main stream media, the British Broadcasting Commission is yet another glaring evidence depicting the relentless efforts by the British government to destroy the Indigenous People of Biafra (IPOB)and possibly shield the name Biafra from the knowledge of humanity again. For this obvious reason, IPOB is bringing to the knowledge of the British government and humanity that we are aware of their already established evil plot to destroy Biafra as they did during the colonial era and in 1967-70. It would be difficult to erase in the records of history that Britain out of their shear hatred for Biafrans and the entire black race invaded Biafra land during the precolonial era and massacred our forefathers in their quest to perpetuate Biafrans into an everlasting slavery and continually catering away our resources forever. History also has it that Britain had diplomatic dealings with Biafra before the creation of Nigeria. John Beecroft was the British consul of the Bight of Biafra, with its head – quarters in Fernado Po now Bioko in Equatorial Guinea from 30th June 1849-10th June 1854. It is clear and understandable that Biafrans had an established government that signed treaties and engaged in several economic activities with countries of the world before the precolonial era. Britain has from time immemorial known Biafrans for possessing supernatural prowess second to non in the world, and as such hates Biafrans with passion. Britain should not forget in a hurry that they are dealing with the new generation of Biafrans. The confirmed best brains of Africa. Once again we remind the government of the great Britain that the intelligent quotient of an average Biafran is second to none in the whole wide world and as such cannot be beguiled by anybody. 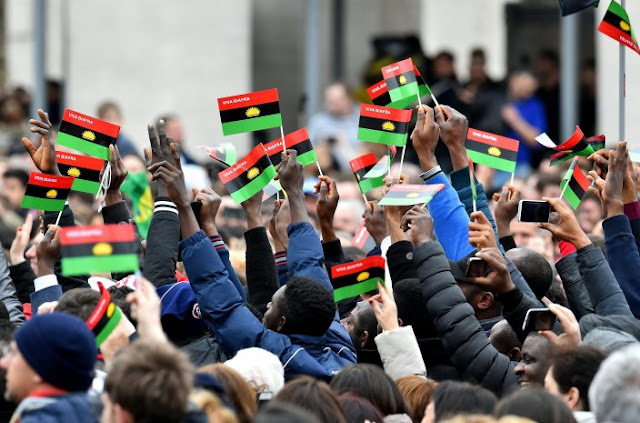 IPOB is an ominous force that will librate Africa from the aging "white supremacy"
The British government having seen that IPOB has once again united Biafrans more than ever before resorted to shattering their "divide and rule tactics" on Biafrans by establishing "BBC IGBO SERVICE". This is simply a new agenda by the British government to continue their aging "divide and rule tactics" on Biafrans. The plot is dead on arrival, because IPOB is here to destroy it. One might ask where were BBC since 1967-2014 when Biafrans needed a voice and had none. It is laughable and one would begin to imagine how BBC who neglected our plight in the past would decide to help Biafrans now that we already have a fierce media and a strong voice to make our voices heard. Is it now that Britain would want to give us a voice via their media just like that, 'free of charge'? We reject it totally and we will have nothing to do with it. It is therefore a clarion call for Biafrans to completely boycott the new "BBC IGBO SERVICE". Do not share, comment or discuss any information coming from the said platform. IPOB and Biafrans of 2018 are more enlighten than the Biafrans of the old and as such are too sensitive to be hoodwinked into such claptrap. We are categorically making it clear to the British government that IPOB is aware of their diplomatic dealing with different countries of the world to scuttle our quest for freedom, but all their plans will fail because Biafrans are hundred steps ahead of them. This is the time for Biafra restoration and we have God's mandate, therefore there is no power that can stop us. However, it could have been a welcome development if they established "BBC BIAFRA SERVICE". Biafrans could have considered giving a listening ear to whatever they would want to disseminate on the said platform. Biafrans already have an intimidating media that is telling our story the way it is. Radio Biafra London, the University of truth is our voice. We do not need any other platform whose message is not projecting the message of Biafra freedom. We have come to restore Biafra or die on the process. Biafra freedom is not negotiable, neither will any man stop it.